Bottom side SV Darmstadt 98 beat Borussia Dortmund , a Chicharito brace downed Eintracht Frankfurt and Hamburger SV score three at RB Leipzig, while the Bundesliga remains on 49,999 goals after a thrilling Matchday 20. How did your Official Fantasy Bundesliga team do on Matchday 20? Check your points tally here! Darmstadt secured their first win in four months as USMNT forward Terrence Boyd scored his first Bundesliga goal against his former club. Borussia got one back just before half-time though youngster Raphael Guerreiro, but the Lilies responded in the second half through substitute Antonio Colak to condemn BVB to a fourth away defeat of the season. The Wolves came from behind to spoil Julian Nagelsmann's first anniversary in charge of high-flying Hoffenheim. Steven Zuber's neat finish had given the away side the lead, but Valerian Ismael's charges gathered themselves to hit back five minutes into the second half through Maximilian Arnold's sweetly-struck volley. Daniel Didavi pounced from close range to give the home side the lead and ultimately all three points. Kyriakos Papadopoulos struck with his head against a former club for the second game in a row to give relegation-threatened Hamburg an early lead against title-hopefuls Leipzig. Fellow new signing Walace doubled the lead from shortly after from another corner. Aaron Hunt rounded off the impressive result in injury time to give HSV a third competitive win in a row and inflict a first home defeat on Ralph Hasenhüttl’s side. Javier ‘Chicharito’ Hernandez got the ball rolling on Matchday 20 with a clinical finish in the opening five minutes. Frankfurt were always in the game until the Mexican doubled the home side’s lead just after the hour with his fifth Bundesliga brace. Kevin Volland then sealed the three points with his first Bayer goal 12 minutes from time as 24-year-old ‘keeper Bernd Leno made his 250th appearance for the club. 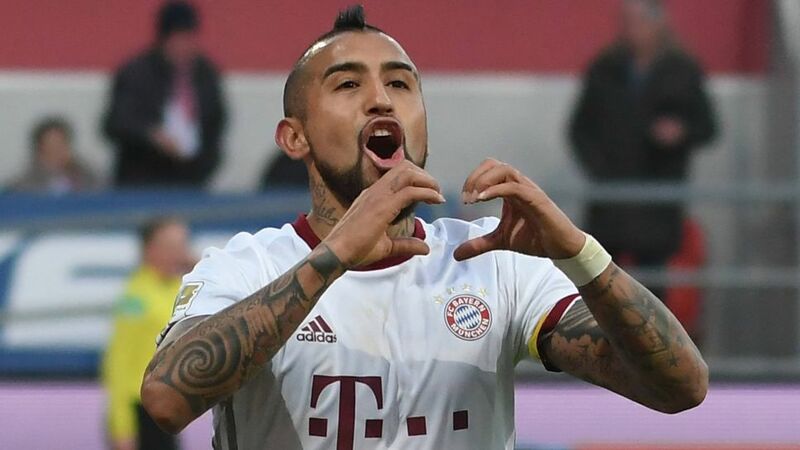 A game that was even for long stretches, Ingolstadt looked like winning their first-ever point against the record champions until Arturo Vidal got on the end of Thomas Müller’s cross in the 90th minute. Arjen Robben added gloss to the scoreline moments late to move Bayern seven points clear of Leipzig in second as Manuel Neuer secured his 100th Bundesliga clean sheet for the club. Vincenzo Grifo was influential as Freiburg saw off Köln in the weekend's final encounter. The attacking midfielder scored his side's opening goal and, after the visitors had levelled through Anthony Modeste's 16th Bundesliga goal of the season, teed up Maximilian Philipp for a 77th-minute winner. The home side took the lead after half an hour with a textbook counter attack as Colombia’s Jhon Cordoba played in Levin Öztunali to head the ball past the onrushing Marwin Hitz. Cordoba was again involved in the second goal when he was taken out by Hitz for a penalty on the hour mark. Jairo Samperio stepped up to convert the spot-kick and ensure all three points for his side on the day loanee Bojan made his first start in the Bundesliga. It was a confident performance by the Royal Blues against the side from the capital, but Schalke needed until just before half time to take the lead through Guido Burgstaller after Nabil Bentaleb’s chipped assist. The Algeria international also aided the second as he played the ball to Leon Goretzka, who did the rest to fire past Rune Jarstein in the Hertha goal. Thorgan Hazard’s fifth Bundesliga goal of the season in the 12th minute was enough for Gladbach to take all three points with them from Bremen. There were further chances for Borussia to extend their lead, but also for Werder to draw level. Neither side could find another goal as the Foals make it three league wins on the bounce.